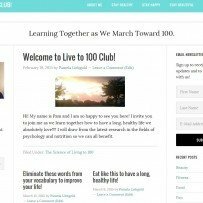 Live to 100 Club - Collective IT Solutions, Inc. This was a quick and simple website we did for a local business trying to start out. We met to define needs and wants and chose features to fit within the budget. Client was very happy with the outcome. This site is mostly all about blogging and includes ads.